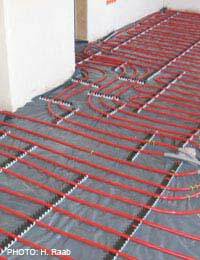 Home > Case Studies > Underfloor Heating: More Efficient? Underfloor heating has become the darling of the property and decorating programmes; it seems that almost every grand design isn't complete without it. As it becomes more popular the components become cheaper and builders get more familiar with it. So would you be able to lower your utility charges by taking out conventional heating and replacing it with underfloor heating? Firstly there are two types of underfloor heating, wet and dry. The dry sort is an electric element or mat laid beneath the flooring and as such is easy to install and cheaper per square metre to buy in the first place. But although it's early days for this sort of underfloor heating the it looks like there's no benefit in terms of lower heating costs. It's therefore better suited to isolated installations in smaller rooms, like bathrooms, where not having a radiator on the wall is a real benefit. So for this article we'll be focussing on the wet sort. This is where long water pipes are laid back and forth across the floor then buried under the screed, with flooring on top. The tubes are then taken back to a central manifold where a computer controls the temperature and distribution of the hot water. Immediately you can see why this type is more expensive to install. It really only makes sense to put it in if you are building a new house or completely gutting a property for renovation. What other pros and cons are there with underfloor heating? Well the reason designers love it is because there are no radiators on the walls, making each room a genuine 'blank canvas' to decorate. This could be a real benefit if you are in a house with small rooms and lots of awkward doors and windows as it could give you a lot more space to place furniture against without blocking heat. Then there's the flexibility. There are a lot of complaints on forums about underfloor heating being difficult to control but its usually because it's been badly installed or the householders don't understand how to use it. Underfloor heating takes longer to heat up and cool down so it needs a very good thermostatic control system which matches the property and the installation. Underfloor heating isn't designed to be turned on and off on a whim the way some people do with radiators. You set a temperature and it will keep to it, and because the heat is spread evenly throughout the rooms and the house you get fewer hot spots and convection draughts. This means that you can usually set a temperature a degree or two lower than you would with conventional central heating and still feel as warm. The good news from a utility charges point of view is that the water only needs to be heated to about 45-50ºC, unlike the near boiling point required for radiators. And with radiators the heat is uneven, causing hot spots and draughts, as convection currents are formed which move air around the room. Recent reports have indicated that underfloor heating systems should be at least 5% more efficient than radiators and can be up to 30% more efficient. But even if you are sure that you'll get that 30%, it's still going to be a long time before you'll pay back all the investment of putting a wet underfloor heating system into an existing property. What should make an underfloor heating system even more efficient is hooking it up to solar panels or a heat pump (either air or ground source) as they can provide water at the lower temperatures required. Neither of these systems will provide water at the temperature that conventional radiators require so they need to be boosted by a water heater of some kind. Note that horror stories are beginning to come out about badly performing heat pump installations. As this technology is in its infancy in the UK it pays to know exactly what it's about and what's being installed. So matching solar panels or a heat pump with properly designed and installed underfloor heating will lower your utility charges. This is particularly so if you can use photovoltaic solar panels and a battery to operate the pumps in the heat source and the underfloor heating. But the financial payback will be a long time coming and lowering utility charges probably isn't a good enough reason to do it on its own. It's probably only worth it if you are building a new property or completely rebuilding an existing one and would have to completely re-so the floors and heating systems anyway.